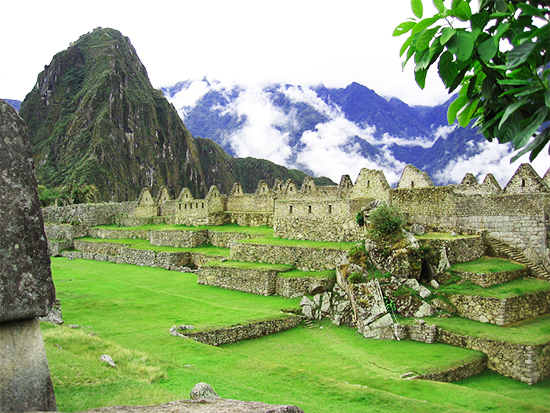 Looking for a lifetime experience while enjoying the Inca culture? We have created an adventure tour to offer you both, enjoying the amazing landscapes with snow-capped mountains, ride one of the most amazing train lines and do exciting adventures hikes around the Inca trail to Machu Picchu! You will as well enjoy and discover the mystery of one of the new modern seven wonders of the world – Machu Picchu! We will pick you up at 04:00 am from your hotel and transfer you to the Ollantaytambo Train Station. Passing some small, colorful towns like Chinchero, Urubamba and Calca we will finally arrive at Ollantaytambo, where we will have a few minutes to have a coffee before boarding the train at 06.40 am. From here, you will enjoy the incredible journey of 2 hours on the train with its panoramic windows where you can observe the Urubamba River descending from the high valley down to the cloud forest at 2000 meters. The landscapes changes drastically in front of your eyes! You will be amazed to see the tropical mountain ending in a snow carpet and the small waterfalls shimering on the hills, forming small rivers that flow down to converge at the Sacred River. After these spectacular natural views you arrive at Aguas Calientes where the warm atmosphere welcomes you with typical jungle sounds. Our staff will be waiting for you at the gate of the train station in Aguas Calientes and bring you to your hostel. In case the room is not available yet, you will leave your bags in the reception of the hotel. Your adventure will start right after! Passing by the local market to organise some snacks and water, you will walk some time along the train line and then reach the little trail to start hiking Putucusi Mountain. The adventure trail with wooden ladders will lead you to the very top of the mountain from where you will will have your first view of Machu Picchu. Afterwards you return to Aguas Calientes for lunch. After a short break we will do our 4 hour hike to the Mandor waterfalls, again starting our walk along the train line and then directing to the jungle. Your tour guide will lead you the way while discovering more about nature, wildlife and local flora until you reach the crystalline waterfall of Mandor. After all this excitement, we return the same way back to town. In the afternoon, you may visit the local hot springs while relaxxing from the hikes. The day you were waiting for! Wake up very early in the morning to have your breakfast (at 04:00 am) and then take the path which is winding up the mountain to reach Machu Picchu, the Lost City of the Incas. Machu Picchu gate opens at 06:00, so arriving early you will be one of the first visitors of the day, avoiding the crowds. In case you don’t want to wake up early, please take the bus at 7 am (not included). 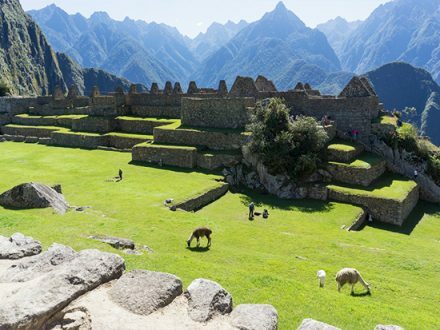 At 07:45 am your bilingual tour guide will take you around the vast ruins for about 2.5 hours, comprehensively explaining the historical significance of Machu Picchu and its importance in the Inca Empire. Machu Picchu is the best known of all the Inca Archaeological sites, as it is recognised worldwide as one of the new seven wonders, even though it’s not mentioned in any handwritten Chronicle of the Spanish Conquerors. Experts believe that Machu Picchu has been constructed around the mid-15th century by Inca Pachacuteq and was rediscovered in 1911 by American historian Hiram Bingham. 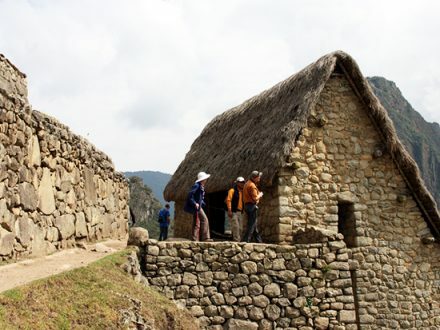 The guided tour of this fascinating site will be an unforgettable experience, visiting the Main Square, the Royal Quarters, The Temple of the Three Windows, the Circular Sun Tower, the Sacred Sun Dial (Intihuatana) and the Burial Grounds. After the excursion you will climb up Huayna Picchu where you will have stunning views over the whole complex! In case Huayna Picchu is already sold out, we will automatically include the hike to Machu Picchu Mountain. After this, you will have some free time to wander around. Optional you can do some unguided walks to Inti Punku, the Sun Gate, which is the traditional end of the Classic Inca Trail (1.30 hours hike both ways), or to the Inca Bridge (1 hour hike). Otherwise you can simply explore the ruins and enjoy the inspiring atmosphere and breathtaking views. A frequent bus service takes visitors back to Aguas Calientes (included) at any time. If you prefer, take a walk down through the jungle – it will take you roughly 45 minutes. You will arrive to Aguas Calientes for a late lunch or to enjoy a dip in the hot springs (not included). In the afternoon late afternoon at 07:00 pm, you take the train back to Ollantaytambo and then a tourist transport to Cusco. If you want to return to Cusco in the early afternoon, please let us know so we can book an early train at 02:30 pm or 04:12 pm (according to the service, it will have an extra cost of US$ 30.00). Extra money (prices in Aguas Calientes can be higher than anywhere else in Peru. While leaving Machu Picchu, you have the possibility to stamp your passport with an elegant Machu Picchu logo at the entrance gate (this is totally legal!). Bring money in case you want use the toilet. Children under 12 years get a discount of 100 US$ on the Tour. Hotel la Cabaña: + US$ 20 per person. Hotel Hatun Inti Boutique: + US$ 40 per person. Hotel Sumaq: + US$ 85 per person. Hotel Casa del Sol: + US$ 135 per person. Please send us a mail with the official request of the Hotel Upgrade or private Tour guide, and we will organize it for you. The upgraded hotel or private tour guide is reserved with the basic price, and then the price difference is added to your remaining balance.